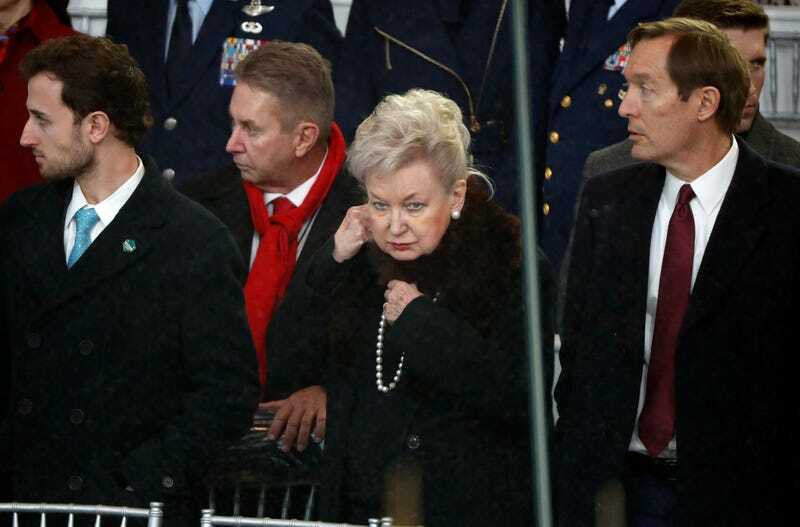 Federal judge Maryanne Trump Barry, sister of President Donald Trump, arrive to view the 58th Presidential Inauguration parade in Washington, Friday, Jan. 20, 2017. Trump has a sister. (Who knew?) Her name is Maryanne Trump Barry. Imagine Trump wearing a powdered wig combed back with a puff on top, and you’d have Maryanne. She used to be a federal appellate judge, then all of sudden, she retired. I’m sure that retirement had nothing to do with a judicial investigation into whether she committed tax fraud and thusly broke judicial conduct rules. Yes, the retirement effectively ends the investigation, and yes, she gets to leave with all the perks that having a cushy job brings. But surely her retirement date and the investigation into how she obtained her inheritance was coincidental, wasn’t it? According to the New York Times, which wrote the scathing in-depth account of how the Trumps skirted the IRS using complicated schemes to avoid paying taxes on their inheritance, Barry filed her retirement papers in February, some 10 days after learning that the investigation into her funds was “receiving the full attention” of a judicial conduct council. While the possibly illegal transfer of funds from Papa Trump to his offspring had already reached the statue of limitations, a judicial investigation hadn’t, and someone filed a complaint against Maryanne. Had Maryanne been found guilty of wrongdoing, the impact of the investigation would’ve affected the president as well. But there was a way that Maryanne could solve all of this; she could retire and end the investigation right where it was, and that’s exactly what she did. To fully understand the depths of Papa Fred’s deviousness, Vox points to a particularly crafty move. So Maryanne skates, with her full pension and retirement benefits, and the Trump family chalks up another one in the win category. And it proves that Donald isn’t the only shady Trump in the family.